Antenatal care (ANC) is of crucial importance to the health of pregnant women and their babies, including through linkage to childbirth and postnatal care. Currently, ANC coverage among pregnant women in low-income, middle-income countries (LMICs) is captured through indicators of number of visits (1+ and 4+) and timing of the first visit. Several recent publications have highlighted issues with content and quality of ANC in these settings. Our results show that most women in the selected 10 countries received some ANC, although patterns of coverage, particularly the mean number of visits, varied greatly by country. However, the self-reported content of care was suboptimal even among women meeting recommendations on number of ANC visits and timing of first visit at the time of survey. This study adds to a body of evidence highlighting the importance of ensuring content and quality of care among the rising proportion of women in LMICs making contact with ANC providers, which is crucial for reducing the mortality and morbidity associated with pregnancy and childbirth. We also call on improving measurement of quality of ANC that can guide further improvements in provision. In November 2016, WHO released new comprehensive recommendations on routine ANC for pregnant women, including adolescent girls.7 This guideline adopted a human rights based approach to respond to the complex nature of ANC practice, organisation and delivery within diverse health systems. It focused on person-centred care and well-being, and aimed to prevent death and ill-health. This ANC guideline includes 49 recommendations: 14 nutritional interventions, 8 maternal and fetal assessments, 5 preventive measures, 6 interventions for common physiological symptoms, 6 health systems interventions and 10 routine recommendations from other WHO guidelines.7 Further, the new guideline recommends eight ANC contacts, with the first contact in the first trimester (up to 12 weeks of gestation) and increased contacts (five) during the third trimester, the time of highest risk for major maternal complications such as pre-eclampsia/eclampsia. Routine ANC has universal components applicable to every woman, but overall the recommendations are designed to be adaptable so that countries with different burdens of disease, social and economic situations, and health system structures can implement the recommendations based on their context and their populations’ needs. Five of the 49 recommendations only apply in a research context. ANC coverage can be estimated via routine health information systems, but in LMICs, it is predominately captured via population-based surveys such as the Demographic and Health Surveys (DHS) and Multiple Indicator Cluster Survey. Global monitoring of the Millennium Development Goals (MDGs) included indicators on the number of ANC visits (1+ and 4+).8 Coverage of 4+ ANC visits is also 1 of 12 core maternal health indicators for global monitoring and reporting for the SDGs.9 However, the number of visits does not provide information on the content of care received in these visits, and was identified as a priority area for indicator development.9 Hodgins and D’Agostino (2014) pointed out that these coverage indicators capture contacts with care providers; instead they called for indicators of effective ANC coverage, by focusing on the content of care received, in order to begin to capture quality of care, an approach conceptually endorsed by Ng and colleagues.10 11 The 2016 WHO guideline also emphasises the importance of quality of care during each contact, highlighting components of essential content of high-quality care. There is a need to develop monitoring indicators which focus on the content of ANC as part of quality of care. The objective of our study is to: (1) Describe ANC coverage using the MDG-era indicators of number of visits (1+ and 4+) in selected countries. (2) Operationalise and examine and timing of the first visit and indicators for content of care based on WHO ANC guidelines, as available in multicountry DHS. (3) Examine the extent to which these measures relate to the MDG-era ANC indicators. DHS are cross-sectional nationally representative household surveys, usually covering 5000 to 30 000 households. Standard model questionnaires are used but can be adapted by each country; optional modules can also be added. The sampling design is a multilevel cluster survey, which often oversamples certain areas; individual women’s survey weights are needed in analysis to adjust for this and for non-response. Respondents are either ever-married or all women of reproductive age (15–49 years). Data are generally based on women’s self-reports, and questions on ANC are asked for the most recent pregnancy, ending in live birth, in a specified recall period. Included countries and selected population indicators. ANC, antenatal care; DRC, Democratic Republic of Congo. We analysed ANC use and content of care among women who needed ANC, which are those who had a live birth in the 3 years (0–36 months) preceding the survey (except in Colombia where survey recall period was 1 year). ANC for the most recent live birth was analysed. We defined use of ANC as reporting a non-zero number of ANC visits or a non-missing location of ANC provision or a valid type of professional who provided ANC. Since both the timing and number of visits were indicators on which we disaggregated care components, we excluded from analysis ANC users who had a missing number of visits or missing timing of first visit. A small percentage of women in the sample (1.25%) reported >30 ANC visits during pregnancy; many of these values are likely to be data recording or data entry errors; these values were recoded as missing and therefore excluded from analysis. The years of survey, extent of missingness and final analysis sample sizes are provided in online supplementary material 1. We used the number of visits as a continuous variable and created categories based on the previous four-visit ANC model13 and 2016 WHO guideline recommending eight contacts: one to three, four to seven, and eight or more. We also reported on all ANC users (women with 1+ visit) and women with 4+ visits (this included women with 8+ visits). The timing of the women’s first ANC visit was measured in the DHS in months, and categorised, based on WHO recommendations, as occurring in the first trimester of pregnancy (months 1–3), or in the second or third trimester (month 4 of pregnancy or later). We also report on categories according to combinations of number of visits and timing of the first visit. Women who reported receiving ANC were asked whether they received specific care components during their pregnancy (eg, ’During any of your antenatal care visits, were you told about things to look out for that might suggest problems with the pregnancy?'). Women were not asked how many times they received each care component, during which visits, with which provider or location, or at what gestation during their pregnancy, with the exception of tetanus injections (asked number and timing of injections across pregnancies) and iron/folate supplementation (asked number of pills). Each country collected information on a slightly different set of ANC care components, and some were asked in slightly different ways. We assessed content of care for three sets of care components: (1) All six components routinely measured across all included countries on the DHS, including blood pressure measured, urine sample taken, blood sample taken, tetanus protection, iron supplementation and receipt of information on potential complications (from now on referred to as ‘routine’ ANC components). (2) All further components measured that were specific to each country, such as having been weighed and receiving intermittent preventive treatment for malaria (‘country-specific’ components). (3) All components measured (combination of first two, ‘all components’ for short). Across the countries, between 1 and 8 country-specific ANC components were captured in addition to the routine, a total of 25 unique components. We excluded receipt of intermittent preventive treatment for malaria in Colombia and intestinal parasite prophylaxis in Egypt as these were not part of their national ANC guidelines, and their coverage was extremely low. The wording of the questions on components of ANC on the DHS questionnaire for each country is shown in online supplementary material 2, together with a mapping of the three sets of components (routine, country-specific and all) onto existing WHO guidelines on ANC care content. We estimated the percentage of ANC users who reported receiving each care component and the percentage of users who reported receiving all six routine, all country-specific and all measured components. For all routine and all measured components, we also calculated the mean number of components received. Each component carried equal weight (simple average). Missing values in receipt of care components were recoded to ‘no’ (did not receive care component); this also applied to missingness due to skip patterns (ie, if a question about a care component was not asked because a preceding prerequisite care component was not received). We estimated the percentage and mean number of components in categories with ≥50 weighted observations. The percentages of ANC users receiving the above care components were estimated for all ANC users and for specific categories of number of ANC visits and timing of first ANC visit. Data analysis was conducted in Stata SE V.15 (College Station, Texas, USA), using the svyset command to account for survey design (sample weights, clustering and stratification). The DHS receive government permission, use informed consent and assure respondents of confidentiality. Surveys included in the analysis were collected between 2010 (Colombia) and 2015 (Rwanda). The sample sizes of women with live births ranged from 2857 (Nepal) to 16 721 (Nigeria), with low proportions of data missing on number of ANC visits and timing of the first visit (range 0.2%–2.6% among women with any ANC), as shown in supplementary material 1. 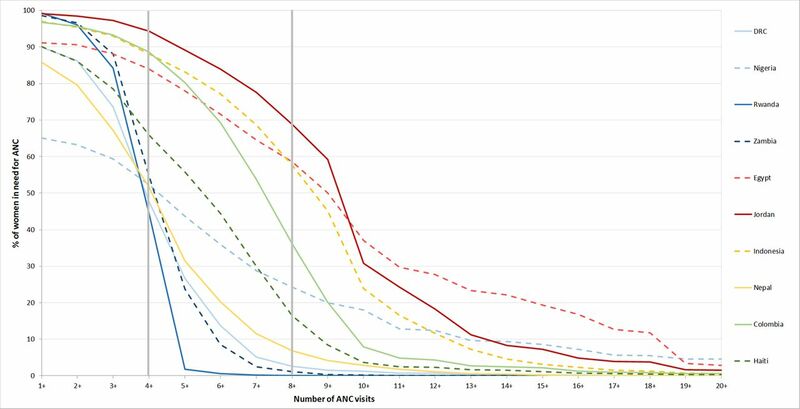 The distribution of the cumulative number of ANC visits among all women with a live birth in the recall period in the 10 countries (women in need of ANC) shows that except in Nigeria, where only 65.1% reported any ANC visits, most women (>85%) who needed ANC received 1+ ANC visits (figure 2). Across the countries, between 44.5% (Rwanda) and 94.3% (Jordan) of women in need of ANC reported receiving the recommended 4+ ANC visits. Distribution of cumulative number of antenatal care (ANC) visits among women with a live birth, by country. DRC, Democratic Republic of Congo. The median numbers of ANC visits among women who received 1+ ANC visits show that women in five countries (DRC, Rwanda, Zambia, Nepal, and Haiti) appeared to have 4 ANC visits (figure 3). Women in the other five countries (Nigeria, Egypt, Jordan, Indonesia and Colombia) showed higher median numbers of ANC visits but achieved them with varying degrees of consistency. This means that in countries such as Egypt and Nigeria, many ANC users did not receive 4+ ANC visits, while a substantial proportion received far more. Box plot of number of antenatal care (ANC) visits among ANC users, by country. DRC, Democratic Republic of Congo. Figure 4 shows the distributions of combination categories of number of ANC visits and timing of the first ANC visit, among ANC users. The two darker green shades represent those complying with WHO recommendations on number and timing of ANC visits at the time of survey. These ranged from 14.9% in DRC to 89.1% in Jordan. The two lighter shades of green represent women with the recommended number of visits, but who initiated ANC after the first trimester. The pale grey represents women who started ANC in the first trimester, but did not obtain the recommended number of visits. Nepal and Rwanda had the highest percentage in this category (14.6% and 18.0%, respectively). However, in both countries, >45% of women in this category received exactly three ANC visits and were therefore only one additional visit away from achieving the recommended number of visits and timing of first visit. The dark grey segment represents women who fulfilled neither recommendation, and ranged from 2.5% in Jordan to 43.3% in DRC. The measures of ANC content for each country by the indicators of number of timing and visits are shown in supplementary material 3. These tables show the percentage of ANC users who reported receiving each measured ANC care component, the percentage of women who reported receiving all six routine and all measured ANC components, and the mean reported number of the six routine and all available care components per country. Coverage of the individual routine components varied by component and country. For example, among women receiving 4+ visits, and starting in the first trimester, blood pressure measurement (>80% in all 10 countries), iron supplementation and blood test tended to be high in most countries (>80% in 8 and 7 of the 10 countries, respectively). 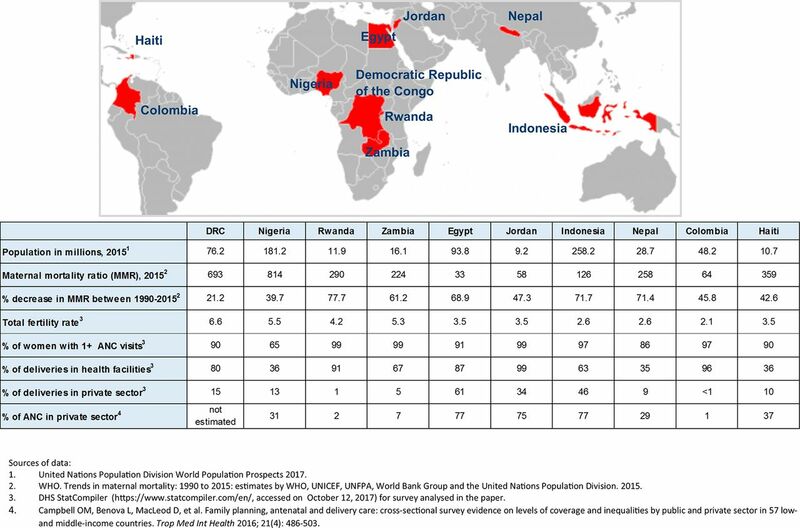 Conversely, receipt of information on potential complications among this category of users was >80% in only four countries (Rwanda, Zambia, Colombia, Nepal). Combination of timing of first visit and number of visits among ANC users, by country. ANC, antenatal care; DRC, Democratic Republic of Congo. The percentages of women who reported receiving all six routine components varied by country and by number of visits and timing of ANC initiation (table 1). Across the 10 countries, women who received more visits and started ANC in the first trimester were more likely to receive all six routine components. However, even among those who received 4+ visits and started in the first trimester, more than two-fifths of women in each country failed to receive all six routine components. For example, 89.8% of women in this category in Jordan did not receive all six components. The countries with the highest percentage of women in this category receiving all six routine components were Nigeria, Nepal, Colombia and Haiti (range 52.0%–54.3%). The percentages of women in need of ANC and percentages of ANC users receiving all six routine and all available ANC components are shown in table 2. The percentage of women receiving any ANC was high (≥85% in all countries except Nigeria). However, in some countries the coverage with 4+ visits started in the first trimester was considerably lower. In terms of the content of care, in sub-Saharan Africa the percentage of women who needed ANC care who reported receiving all six routine components was comparable or better than the percentage of women getting 4+ visits started in the first trimester. This means that even women who had one to three visits and/or initiated ANC later in pregnancy were likely to receive the six routine components. However, for countries in the other regions, the picture was consistently worse. Even among women with many ANC visits (8+) starting in the first trimester, less than two-thirds of women in any country reported receiving all six routine care components. However, the countries with the highest percentage of women with a high number of visits (8+) who reported receiving all care components (Nigeria and Nepal) were those with the lowest levels of overall ANC coverage. ANC provides a critical opportunity to support pregnant women and ensure that they, and their babies, benefit from effective, good-quality maternal care. This paper responds to an urgent need to understand the provision of ANC to women in LMICs as was done in the MDG-era, and its content, in order to identify gaps and to inform the development of measures focusing on quality of care. We estimated MDG-era ANC indicator of number of ANC visits in 10 countries using recent DHS data. In all countries, the large majority of women had 1+ ANC visits (ranging from 65% in Nigeria to >98% in Rwanda, Zambia and Jordan). In all countries, over two-fifths of women had 4+ visits (ranging from 44% in Rwanda to 94% in Jordan). On the other hand, the percentage of women who had eight or more visits ranged from 0% in Rwanda to 69% in Jordan. Among women who had ANC, the proportions having 4+ visits and starting in the first trimester ranged from 15% in DRC to 89% in Jordan. In the 10 included countries, between 7 and 14 country-specific ANC components were captured by DHS, of which 6 were common across all surveys. We captured ANC content through understanding the percentage of women who reported receiving each ANC component as captured on surveys, the percentage who reported receiving the six routine components, the percentage of women who reported receiving all components, and an average combined score of available components. We found that receipt of the six routine components varied widely. Across the countries, the most commonly reported component was blood pressure measurement; urine test and information on complications tended to be the least commonly received. Only in Colombia did women with 1+ ANC visits report receiving, on average, more than five of the six routine care components. We examined 10 countries, which do not represent the variety of experiences and results achieved by LMICs globally, but rather serve as case studies of a range of contexts across four regions to exemplify gaps in ANC coverage, content and quality. In relating these content measures to ANC utilisation patterns, we found that even among women starting ANC in the first trimester and receiving 4+ visits, the percentage receiving all six routine ANC components was low, ranging from 10% in Jordan to just above 50% in Nigeria, Nepal, Colombia and Haiti. This suggests that even among women with patterns of care that complied with global recommendations at the time of the surveys, the content of care was inadequate. The limitations of our analysis stem predominantly from our use of secondary data. Surveys were conducted between 2010 and 2015 and all indicators of ANC use and content rely on women’s self-report of events during the pregnancy preceding their most recent live birth. We have no information about patterns of ANC use and content of care for women with pregnancy loss or stillbirth, as these were not collected by the surveys. Women’s ANC might have occurred up to 3 years before the survey (and one in Colombia), during which women might forget whether they received a particular component of care. Their reports may be prone to social desirability bias.14 The six routine components of ANC care we used are not necessarily the most important components of ANC; rather these six components were the ones that were measured consistently across the included countries and were therefore comparable. Some of these components should be provided at every ANC visit (eg, blood pressure measured), others might only be needed once, but for which good communication and interpersonal skills are needed (eg, information on complications). Others could result from care received prior to the index pregnancy (eg, tetanus toxoid immunisation). For three of the six routine components which should be provided multiple times during a pregnancy, women were only asked whether they received the component ‘at least once’ during the pregnancy. Additionally, for issues such as counselling about complications, we cannot be sure that women were provided with complete and accurate information. Therefore, our estimates of care coverage do not reflect either the correct timing and frequency of these care components across women’s ANC visits during pregnancy, or whether the care following on from these components was completed appropriately (eg, What tests were done on the woman’s blood sample? Was the woman informed of the results? Was the appropriate action taken based on the findings?). Other important components of ANC, for example, women’s experience of care, were not captured at all. These limitations, together with a validation study from China suggesting some over-reporting of ANC care components received,14 make it probable that our results overestimate the percentages of women receiving the ANC components. Our examination of ANC content showed various patterns suggesting context-specific drivers of high and low coverage of specific ANC components. It is interesting to compare the relatively low percentages of women with 4+ visits/start in first trimester receiving all six routine components to the relatively high country means of the number of components received (the lowest was 4.0 in Indonesia and the highest 5.4 in Colombia). This means that, on average, countries were only one or two components short of providing all six routine components. In the six countries with means of at least five components (on average, one component too few), all had one particular ANC component lagging behind in coverage (information on complications in Nigeria and Haiti; urine test in Rwanda and Zambia; blood test in Nepal; and tetanus in Colombia). Such patterns also emerge for the four countries which averaged between four and five components, where focusing on one to two specific-care components would have greatly enhanced the percentage of women with all routine components. The mapping of the routine components with the lowest coverage showed interesting within-region consistencies in the care components in greatest need of improvement: sub-Saharan Africa (urine test and information on complications), Middle East (information on complications, iron supplementation and tetanus), Asia (urine test and blood test) and Latin America and the Caribbean (tetanus and information on complications). We showed a large gap between the number of ANC visits (1+ and 4+) and measures of ANC content. This issue has been highlighted by studies using other data sources.28–30 Our findings bolster studies highlighting suboptimal quality of ANC in LMICs in general,31 32 and among socioeconomically vulnerable groups of women in particular.18 33 We found evidence, particularly in countries outside sub-Saharan Africa, suggesting that the focus on the number of ANC visits may have been to the detriment of ensuring effective coverage. 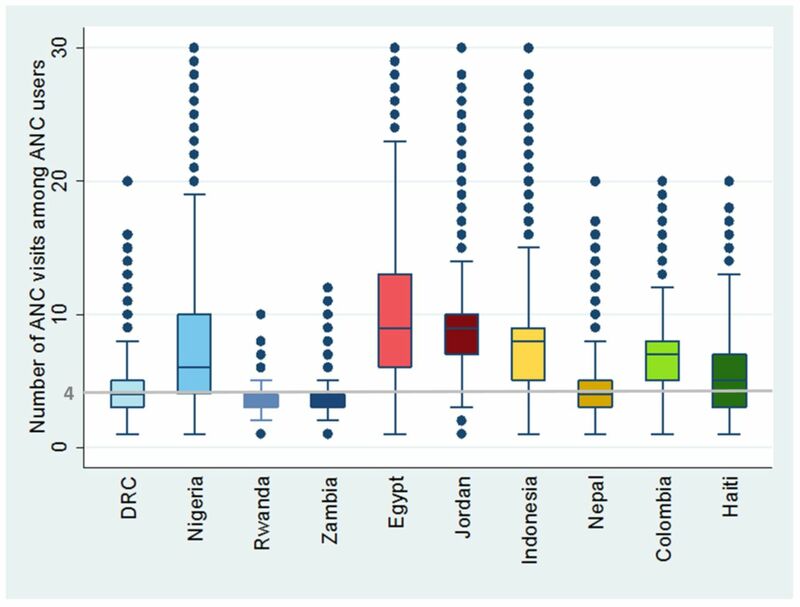 Countries with larger variations in the number of ANC visits (eg, Egypt, Jordan, Indonesia) were less likely to reach high coverage with all six routinely measured components of care, despite their higher overall median number of visits. This was true when ANC content was assessed among all women with need for ANC and among women who received 4+ ANC visits and started ANC in the first trimester of pregnancy. Global coverage with ANC visits starting in the first trimester of pregnancy increased by 43% between 1990 and 2013 to a level of 58.6%.36 Research shows that the quality of ANC matters for the survival of the mother and child,37 38 carries crucial importance in the pathway to women’s use of skilled delivery care,21–23 and can contribute to a positive pregnancy experience.24 The 2016 WHO ANC recommendations shifted the focus from coverage to quality and terminology from ANC visits to ANC contacts, implying an active connection between a pregnant woman and her healthcare provider(s). A ‘contact’ can take place at the facility or community level, and may include context-specific recommendations depending on the health system (eg, task shifting some responsibilities to community-based workers) and on burden of disease (eg, prevention of malaria during pregnancy).39 WHO is currently developing a monitoring and evaluation framework based on the new ANC recommendations that will be finalised by the end of 2018, and which will include content of care. Not any one tool/method or indicator will capture all dimensions of care (frequency, initiation, quality), and several sources should ideally be used in order to triangulate results of coverage and quality, in addition to gathering other data helpful with identification of problems and potential solutions (such as supply stock-outs, etc) (box 1). Did anyone tell you about your estimated delivery date? Were you informed of the results of the blood/urine sample taken? How can women’s experience of care related to respect, communication and support during ANC be measured? Providing a ‘don’t know’ response option for receipt of ANC care components could minimise error due to social desirability. Other data sources could also be explored as routine health management information system data such as District health information system 2 (DHIS2) and digital registries and integrated mHealth strategies become more common.40 Provider surveys (Service Provision Assessment (SPA)/Service Availability and Readiness Assessment (SARA)), routine supervision visits/ANC consultation observations, client exit surveys, mystery client visits, and women-held ANC cards are other methods for measuring different aspects of ANC for monitoring and improvement purposes. In light of this paradigm shift, global and national progress towards universal coverage with good-quality ANC can only be monitored by rethinking which content of care and which indicators are measured and why, ensuring that the tools and data sources used to capture these indicators are appropriate, valid, reliable and complementary, and that mechanisms exist to ensure efficient and effective action to improve care quality on the basis of these indicators. The authors thank Ms Emily Wilson for assistance with preparing the tables. The authors also thank the DHS program for collecting and making available the data and the women who participated in these surveys. World Health Organization. Global Strategy for Women’s, Children’s and Adolescents Health (2016-2030). Geneva: WHO, 2015. United Nations. Sustainable development goals. http://www.un.org/sustainabledevelopment/sustainable-development-goals/ (accessed 14 Nov 2017). World Health Organization. WHO recommendations on antenatal care for a positive pregnancy experience. Geneva: WHO, 2016. United Nations. Official List of MDG indicators. 2008 http://mdgs.un.org/unsd/mdg/Host.aspx?Content=Indicators/OfficialList.htm (accessed 14 Nov 2017).
. The quality–coverage gap in antenatal care: toward better measurement of effective coverage. Science and Practice: Global Health, 2014. World Health Organization. WHO Antenatal care randomized trial: Manual for the implementation of the new model. Geneva: UNDP/UNFPA/WHO/World Bank Special Programme of Research, Development and Research Training in Human Reproduction, 2002.
. Factors that influence the provision of good-quality routine antenatal services: a qualitative evidence synthesis of the views and experiences of maternity care providers. Cochrane Database of Systematic Reviews 2017;8.
. Quality and comparison of antenatal care in public and private providers in the United Republic of Tanzania. Bull World Health Organ 2003;81:116–22.